Love your take on the pattern! Much better! I should add: anyone who wants to make this might want to enlarge the pattern a little more than 200%, to make sure there's enough room for presents. I'm glad i did that. just recently found your blog via cake + pie and what a great find! 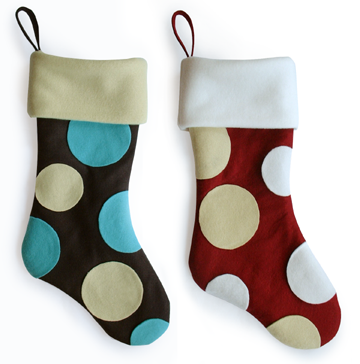 i love the bold pattern and the colors you used on these stockings. That's really very nice! Since I happen to have a younger sister who likes to craft (she makes my niece things, and made me sheets, for example), I think I'll try my hand at this to replace my somewhat worn current stocking for next year. I'm thinking something in cream and buff, probably. Buff! Listen to you! :) I don't even know what color that is! :) Fancy. Is buff similar to "fawn" or "camel" or any of those animals?